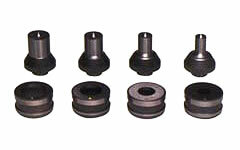 SH-70A Hydraulic Punches: Izumi Products. The portable SH-70A punch was designed to punch holes through 13mm mild steel, aluminium and copper. A stripper guide extends on either side of the ram to strip the material after punching. 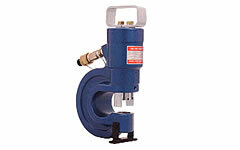 This powerful punch will operate from any 700 bar or 10,000 PSI hydraulic pump. The SH-70A comes complete with four sets of punch and die sizes for 1/2", 5/8" and 3/4" bolts and carrying case. 70mm throat depth allows commonly used angle iron. Punch & Die: 10.5, 13.5, 17.5, 20.5mm diameter, Hand pin, steel carrying case.